Shadley van Schalkwyk starred with bat and ball as St Annes defied the form book with a 45-run win over Blackpool in the Vernon Road derby. A rain-hit day in the Northern Premier League also saw Fleetwood hammered at Netherfield, where they were dismissed for just 47. Blackpool’s first league defeat of the season denied them the chance to go top of the first division on a day leaders’ Leyland’s clash with Kendal was one of three NPCL matches to be abandoned. The Fylde coast derby was reduced to 33 overs a side and saw hosts St Annes set a target of 149-7 after choosing to bat. South African professional van Schaldwyk reached a half-century for the third time, making 57 and sharing in the game’s best partnership with opener Gurman Bains (39). Wicketkeeper Richard Staines (29) made the other contribution of note as Josh Boyne took 3-36 from 11 overs and Jamie Thomson’s six very tidy overs went for only nine. Van Schalkwyk then took charge with the ball, bowling unchanged for 16.3 overs and returning his best St Annes figures of 7-42 to dismiss Blackpool with three balls left. He removed top-scorer Matt Houston for 48 and won the battle of the pros with Blackpool’s Daryl Mitchell, who was expensive with the ball and fell to van Schalkwyk for just seven. Boyne supported Houston with 26 but the other nine Blackpool players struck just 24 between them and none reached double fixtures as their four-match winning run was halted. Blackpool remain second but are now 10 points behind Leyland. Fleetwood were humbled by a 211-run margin in a 40-over game in Cumbria. Netherfield chose to bat and Tom Bruck made light of the heavy conditions with 112 from 71 balls, which included six fours and 10 sixes. Coming in at 43-2, Bruck shared in a stand of 63 for the third wicket with Ben Phillips (40 from 42 balls) and of 145 for the fourth with wicketkeeper John Huck (69 from 52 with seven boundaries). All the Fleetwood bowlers suffered, though Adam Parker at least took three wickets in his 15 overs (for 82). The Netherfield attack had no such problems, ripping through the Fleetwood batting in just 14.3 overs. Daniel Ingham led the way with 6-13 from 7.3 overs, bowling unchanged with Nathan Chambers, who removed the top three on his way to 4-24 from seven. Professional Travis Dean was Fleetwood’s top scorer with 14, putting on 28 for the first wicket with Parker. But Fleetwood managed only 19 more, their other nine men managing only 11 between them with the bat. Fleetwood slip a spot to fifth, behind Chorley and Barrow, who drew the only other first division game to reach a conclusion on Saturday. Lytham’s three-match winning run ended with a 43-run defeat away to Liverpool Competition leaders Northern. The hosts were put in at Moor Park and declared at 220-5 from 55 overs, number three Davy Smith finishing unbeaten on 93, having hit nine fours and a six in 117 balls. Smith put 120 for the third wicket with Liam Grey (40) and 50 for fourth with Jack Boardman (34), despite the best efforts of Lytham’s Lancashire all-rounder Toby Lesater, who took 3-40 from 14 overs. Captain Dom O’Brien took the battle to the Crosby club, but after the other three members of Lytham’s top four scored only nine between them it was always an uphill struggle. Australian O’Brien scored 52 from 70 balls (11 fours) but Lytham were dismissed for 177 in 44.2 overs as no match-changing stands developed, despite Luke Williams adding 43 and Matthew Taaffe 38. Scott Snaylam disposed of Lytham’s middle order on his way to 4-54 from 9.2 overs, while Tomas Sephton took 3-78 off 18 and Ryan Maddocks’ eight overs went for just nine runs. Lytham remain sixth in the ECB Premier League. Garstang returned to winning ways in style, inflicting a first Palace Shield defeat of the season on former leaders Fulwood and Broughton by five wickets. Vernon Carus went top of the premier division courtesy of their seven-wicket win at Great Eccleston, while Garstang remain 10 points off the pace in third. 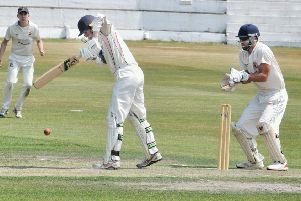 Thornton Cleveleys won the Fylde coast derby at Freckleton by five wickets, overtaking them to move into fifth place. Vernon Carus also lead the way in division one, their second XI defeating second-bottom Kirkham & Wesham.